The 35-year-long successful business relationship between Polaris Trykk AS in Trondheim, Norway, and KBA has entered a new phase with the decision for a highly automated 48pp Cortina with dryer. “By investing in a KBA Cortina waterless press, our goal is to be the leading newspaper printing plant in Norway when it comes to quality and productivity,” says Polaris Trykk managing director Steinar Bakken. “Along with printing newspapers in coldset, with the installation of a dryer we seek to broaden our product spectrum with semi-commercials (supplements, magazines) on coated paper. By producing top-quality coldset, heatset and hybrid products we will be able to offer our customers more options, expand into new markets and be better equipped to face competition from electronic media. The Cortina’s impressive green credentials influenced our decision especially as our media group and many of our customers place great importance on environmental matters.” The waterless Cortina is scheduled to go live in autumn 2014 and will replace two existing KBA Express press lines, which in 1997 replaced KBA Commander press sections delivered in 1978, 1987 and 1994. Polaris Trykk in Trondheim is one of the largest printing plants in Norway. Its history goes back to 1767 and the foundation of Adresseavisen, the oldest running newspaper in Norway. The media group is 100% owned by Polaris Media, one of the country’s largest media houses which emerged from Adresseavisen newspaper house. Along with its print business, the group is also very active in the electronic media arena and is a leader in providing cross-media information via the internet, print, radio and television. The highly automated Cortina will have a cylinder circumference of 1,120mm (44in), a 560mm (22in) cut-off and a maximum web width of 1,600mm (63in). It will be capable of delivering 48 broadsheet or 96 tabloid pages, all in full colour, at a rate of 40,000 copies per hour. The reels will be transferred by AGVs to the KBA Patras A automated paper logistics system which will convey them to the reelstands, position and load them. Three KBA Pastomat A reelstands with infinitely adjustable divided arms enable fast and flexible edition and pagination changes. The KBA stripping station makes the employees’ work easier and increases hourly output. The three just 4m-high (13ft 12in) compact printing towers provide practical and proven features: automatic plate changing and blanket washing systems, automatic roller locks for stable print quality, pushbutton setting of the optimum printing pressure from the console extending the service life of the roller coatings, gearless and oil-free printing units with AC direct drives plus user-friendly operating and maintenance displays. The press’ 13m-long hot-air dryer features an internal thermal after-burning unit which lowers gas consumption. In addition, the high-performance KF5 jaw folder (2:5:5 cylinder ratio) is in the superstructure equipped with two 71° formers, a gluer, three ribbon stitchers and a ribbon splitting device. Length and cross perforation, the KBA section stitcher and a quarterfold support high flexibility and a broad product range. As tabloid pages are widespread in Scandinavia, KBA’s ribbon splitting device will be added to ease production and cut makeready. This allows the webs to be guided unturned over both formers, and the slit ribbons then to be assigned more flexibly to the three KBA ribbon stitchers. There are plans to add a further reelstand, printing tower and folder to the Cortina at a later date. 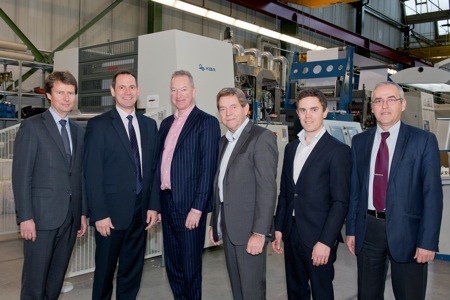 “We are very pleased that the longstanding, successful business relationship with Polaris Trykk is continuing with the next generation of presses and we are delighted to offer our customers new opportunities and open doors to new markets with our waterless technology for coldset and also heatset. Following the Cortina presses in action in Denmark, Sweden and Finland waterless newspaper and commercial printing has now taken hold in Norway too”, says KBA sales director Jochen Schwab. The Cortina going to Polaris Trykk in Trondheim is the second order of its kind so far this year. The other waterless press is heading to Volksfreund-Druckerei Nikolaus Koch in Trier, Germany.